to see those beautiful colors! my choice of where we go. YAY! So I hope you all have a wonderful weekend as well. omg you look beautiful! gorgeous coat! love!! I like what you post. love the coat, the color is great ! I love that colour as well because it makes foggy days look brighter! I was buying online clothes and I realised that 8/10 choices had that colour! What a DARLING outfit that is! 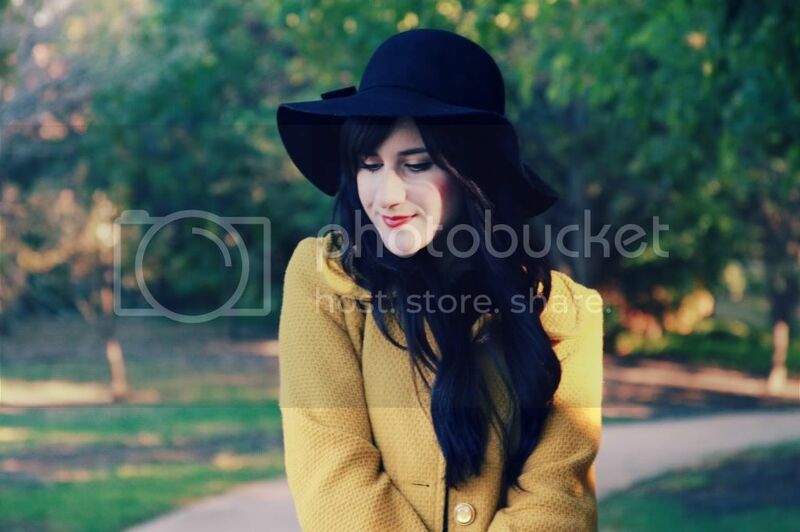 The mustard coat is my favorite though. That color is gorgeous. It'll look so pretty when it snows. I love wearing color in the winter :) Makes everything a little bit brighter! I love your coat...it makes a lovely antidote to the cold weather and the traditional drab coloured coats that usually accompany it!! So cute! I love your coat. I'm seeing more and more of this color and I love it! Oh my days, I love this coat - the mustard yellow colour is fabulous and I too want a coat that colour. Gorgeous coat! The color looks so fabulous on you. I love it with the floral print dress and cute shoes too. Happy fall, stay warm! 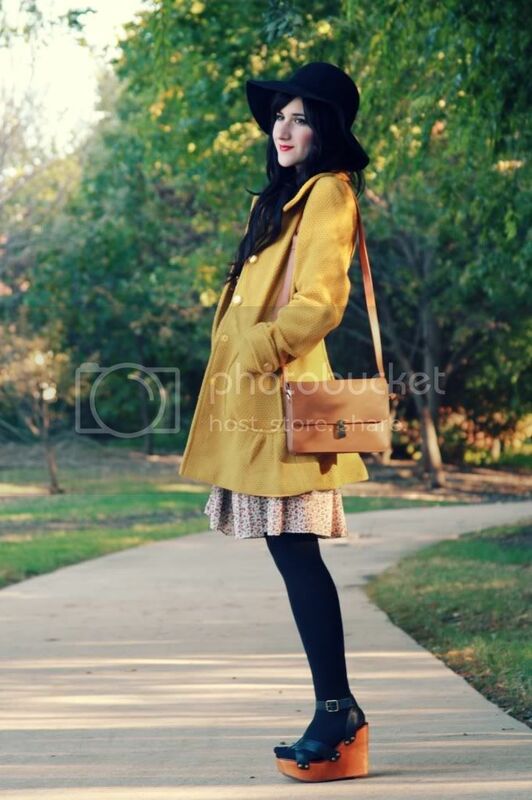 The mustard hued coat is a beauty! Such an autumn perfect gem. Looking cute as always, girl! gorgeous coat, such a lovely colour. love your hat too, just love your style! Beautiful outfit, your coat is amazing. Such a pretty coat! I agree that a pop of color can brighten up a drab, cold day. I also love how you wear sandals and tights, it's so cute! I love how you matched the jacket with a printed dress. I love the brightness of this outfit. Sush a beatiful cota & I guess it's more versatile I would have thought. Beautiful coat! I definitely need to add some mustard to my life, the harmony with the dress is so beautiful! Happy weekend! Mustard is my favorite fall color! This coat is spectacular! I know what you mean. We have snow on the ground and green leaves in the trees. Say whaaaaaaat???? The yellow coat is so lush!! You always look sweet, romantic, retro and trendy on your photos! Way to go! That's a reaaaally pretty coat girl! Great choice, love that mustard yellow on you! Visit my blog if you don't know yet:)! Your dress is just adorable and I love the colour of your coat!! you look stunning there! Great coat <3 love it!! I love it! Absolutely wonderful. whenever i need inspiration i go to your blog, i love it! oh that yellow is so adorable on you bonnie! Those sandals are so cute! The perfect pop of colour! <3 Bonnie, I simply adore your gorgeous outfit! Yellow is my absolute favourite colour of all; and I love it when people are brave enough to wear it! you look adorable, as usual, and the yellow coat look wonderful on you! You are one of the most beautiful person I´ve ever seen! And your hair is amazing! The coat is so lovely! I am not one to like yellow, but I love your coat, guess there's a first for everything. Gorgeous coat & I absolutely love your bag. Your outfit is just perfect, love the style! The shoes and coat are awesome. I'm having a give-away on my blog and I really hope you will join too! I wish the sun will go away and I could wear my Winter collection.. Your new coat is beautiful! I love how it looks with that dress. Ooh I absolutely adore this coat and the mini waffle-like fabric! 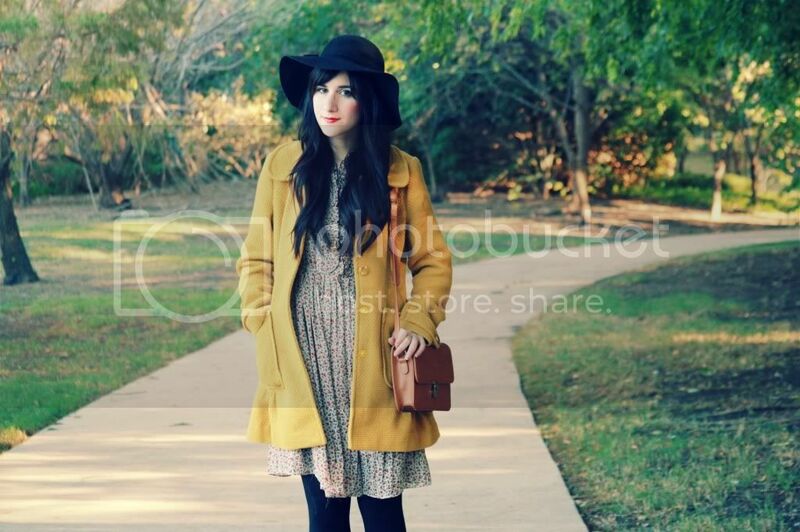 It's so much more fun to wear bright winter coats too :) Also, the print on the dress is so cute. All these colors together are a perfect match!!!! What a beautiful color on you! That coat is all kinds of gorgeous! I'm in <3! 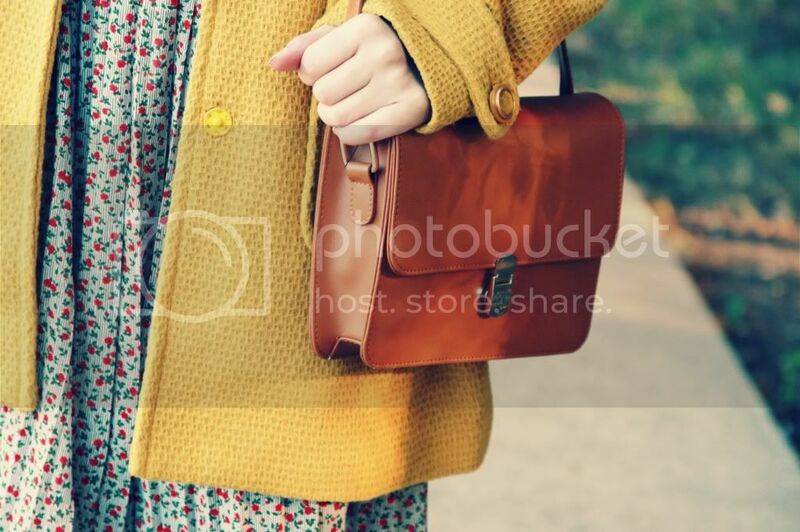 Your mustard-colored winter coat is just awesome! The collar on it is great. I really like it paired with the floral dress. Cool shoes and cute hat too! Lovely coat! The color is beyond fantastic. I love that mustard coat Bonnie. You look so beautiful! 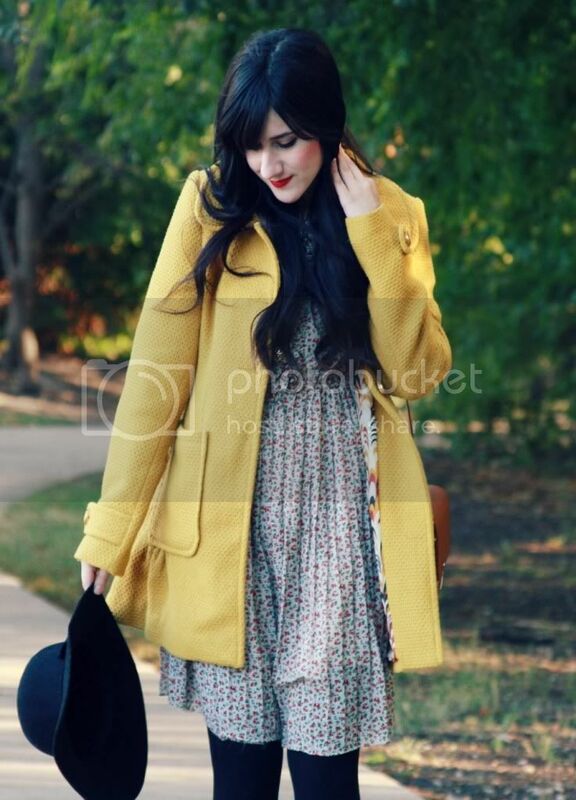 Gorgeous mustard coat. Looks lovely with the vintage dress. You look great in mustard! Cute shoes! Nice yellow coat! Mustard yellow is kinda my obsession right now. That coat is perfect! Mustard yellow is definitely a favourite colour of mine this fall! beautiful outfit!!! i adore it. Will give a look at my blog? Love your coat in the Trend Color Yellow !!! You're so adorable! So glad I came back here, following you now!